Filed to: SCOOBY-DOOBY-DOO!Filed to: SCOOBY-DOOBY-DOO! Stop Pigeons. Be warned big revelation spoilers follow! DC Comics have a weird beast in Scooby-Doo Team-Up. Each issue of the comic unites Scooby and the Gang with the best (and worst) that the Hannah-Barbera and DC universes have to offer. Along the way they are not afraid of touching sacred cows or at least providing closure for key characters or longstanding mysteries. Scooby-Doo Team-Up issue 44 is no exception. I think Sholly Fisch (that’s a great name) is having fun. For example, a recent issue saw Mystery Incorporated team with Penelope Pitstop and the Ant Hill Mob. Penelope remains delightfully ignorant of the Mob’s gangster status but mentions that some have gone away for choir practice (They’ve gone to Sing-Sing). There is a nefarious plot afoot that drives the issue but it ends with The Hooded Claw being unmasked as Penelope’s guardian, Sylvester Sneekly. He is carted off to jail complaining about those meddling kids and Penelope and the Ant Hill Mob are free to go off and do whatever they please. No more perils? Another issue teams the gang with the Challengers of the Unknown. Or at least it would if the Chals took them seriously. Determined to solve they mystery themselves, we see Scooby and Co team with Rip Hunter, Cave Carson, Sea-Devils, Blackhawks, etc. They solve the mystery and gain the Challengers respect. For an encore a friendly member of the Legion of Super-Heroes reveals the true identity of Mockingbird, the mysterious leader of the Secret Six. Everyone knows who he is in the future. Their latest adventure sees them called in by Dastardly and Muttley to try and find a final solution for their pigeon problem. As you might expect, Dastardly isn’t playing straight when he gets the gang into deal with a phantom pigeon tormenting Vulture Squadron, but he is soon hoist on his own petard as his scheme backfires. Mystery Incorporated team up with Yankee-Doodle Pigeon to set things straight. But one major mystery persists. Why were Dastardly and Muttley after the pigeon in the fist place? There is no war. Why do they have the need to chase him down for destruction? And this is the biggest spoiler of them all! You might want to stop here. 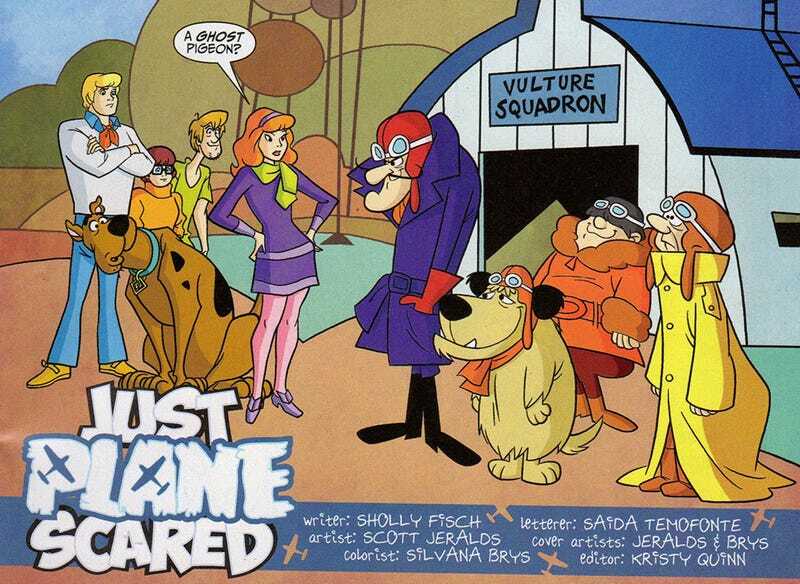 Once again, Scooby-Doo Team-Up goes where angels fear to tread and reveals the real honest to gosh reason that Dastardly and Muttley launched that mission to stop the pigeon. Smash him, grab him, bash him now! And they are still at it!